Loading new drill sets onto the ppb system from a flash drive using the OS of the micro computer rather than the mechanism built into the software can help trouble shoot problems and make it easier to customize your folders and practice sessions. This article will be a step by step guide to help you through the process. let’s get started! 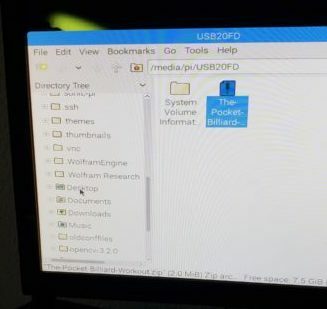 When you plug in the flash drive that has a zipped version or the drill set on it, you will see a dialog with the option to “Open in File Manager”. Right click on the zipped package and select copy. Then scroll the left panel of the dialog up to the top and expand the “pi” folder. After the “Pi” folder is expanded, scroll the panel down and double click the folder that says “Desktop” pictured below. 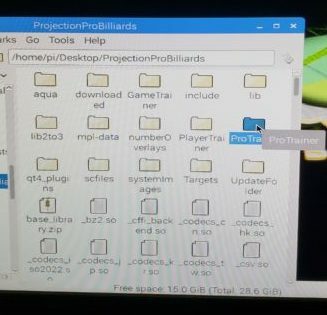 Open the “ProjectionProBilliards” FOLDER and open the folder you would like to place the drill set in. In this example, we will be using ProTrainer. When you open the ProTrainer Folder, right click and select paste. Your copied folder should now be in ProTrainer. If the copied folder was not in a Zipped format then you are done and can use the new drills in the PPB Training system just like the standard Pre loaded drills. 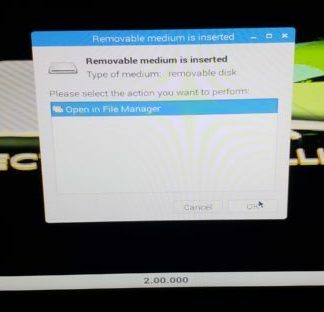 If the folder was zipped (which it should be if you were experiencing problems with the software’s built in drill uploader)there are just a few more steps. Right click the newly pasted zipped drill set and select “extract here”, If the drill set came from the official PPB website the drills will be “nested” in a containing folder that we recommend the drills are for (this is to make it easier to use the built in uploader). You can either leave them in the nested folder, in this case another “proTrainer” folder. 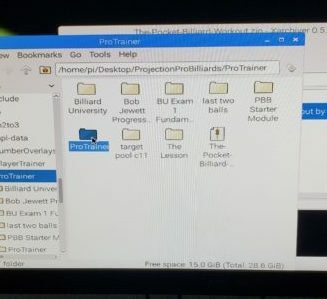 or you can open the newly pasted “proTrainer” folder and “right click”-> “cut” the contained folder(s), Then hit the back button and paste them to the Training systems original “ProTrainer” folder. When you are finished and happy with the placement of the new drills, you should clean up the folder to save space by deleting the zip file. As always, please give Mike a call or shoot him a text if you have any questions. We are always here to help and would much rather you ask than become frustrated. Happy Practicing, we will see you all next time.